In anticipation for the weekend when we go hog-wild installing the water supply system, I have been stockpiling the materials. Two rolls (each 50 feet) of 3/4-inch PEX water pipe - these are the smaller rolls secured with black ties. 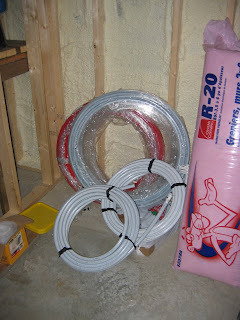 Two rolls (each 250 feet) of 1/2 inch PEX water pipe - these are the larger rolls secured with plastic wrap. There is one roll of red PEX and one white. I wanted a roll of blue but my supplier did not have any in stock. In any case the white PEX pipe was less expensive. I was hoping to use red for hot water and blue for cold water. COMING: The supply system scheduled for installation in two week so stay tuned - I'll discuss then.